August | 2013 | Beer Apprentice - Craft Beer News, Reviews, Interviews and Info. Oh yeah, it’s about time to crack open another brew for a craft beer review. Today, I’ve got the Goose Island 25th Anniversary Ale produced by the Goose Island Beer Company located in Chicago, Illinois in my possesion. We all know about Goose Island, so let’s forgo all of the small talk and check out the website, gooseisland.com, for a commercial description. Brewed as a collaboration between Goose Island Brewmaster Brett Porter, Senior Brewer Keith Gabbett, Pub Brewmaster Nick Barron and Alumni Brewmaster Greg Hall. Deep mahogany color, rich fruit aroma with notes of lilac, big malt body with touches of roast and a dry, crisp finish. This beer came in a 12 oz. bottle with an ABV of 6.4%. It poured a nice amber/caramel color. Quite clear with some burnt orange highlights around the curves of the nonic glass. A fairly easy pour produced a very light tan head that was smooth and creamy. It wasn’t extremely large and the retention time was only so-so. The lacing was a bit underscored and thin too. The aroma brought forth a nice toasted biscuit and toasted bread crust profile. A slight amount of toffee and a light waft of nuttiness tickled my nostrils. I even discovered the most faint scent of orange peel. It smelled really nice for the style and I thought it was very well balanced. The mouthfeel was medium bodied. Smooth, kind of creamy, a wee bit chewy and mostly dry. A good medium strength carbonation was to be had and even a feeling of warmth was found. A nice shot of flavor was left behind on the palate after each sip as well. Yeah, there is no doubt that this is nice beer. Definitely worth a try. It has a great malty profile that would suit the Fall season to a “t”. It’s very flavorful and semi-complex, yet retains an ease of drinkability that couldn’t be denied. I think I could set several of these down at one time without having too much trouble. I may have to watch out though because at 6.4% ABV I’m sure it would get on top of me in a hurry. 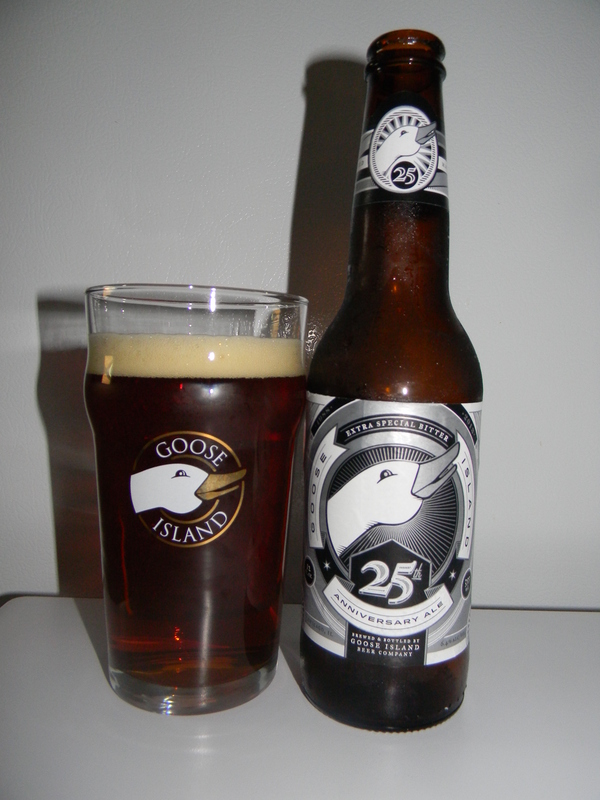 Have you guys tried the Goose Island 25th Anniversary Ale yet? If not, give it a whirl and see what you think. I’d be interested in hearing your opinion. 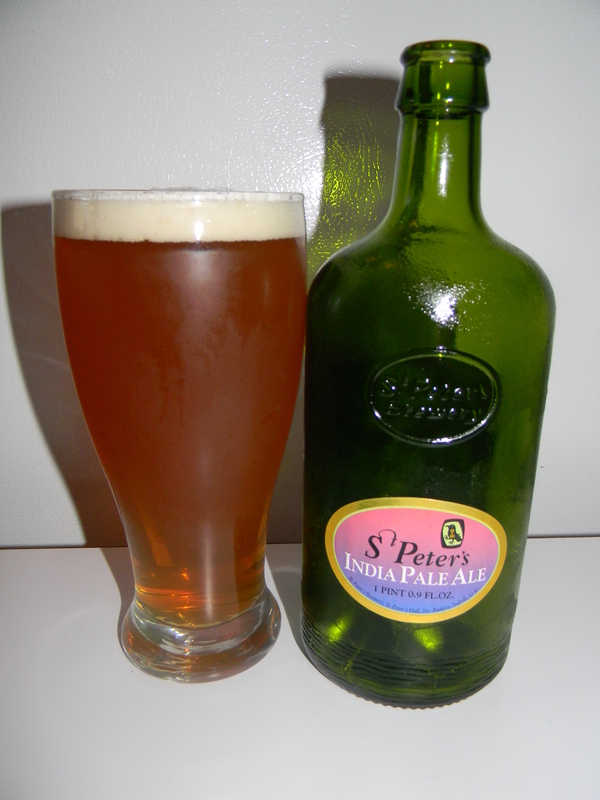 It’s time for another craft beer review guys and for today’s tasting I’m going to be trying the St. Peter’s India Pale Ale brewed by St. Peter’s Brewery Co. Ltd. situated in St. Peter South Elmham, Bungay, Suffolk, United Kingdom. I always enjoy trying the brews from St. Peter’s, so let’s get to the website, stpetersbrewery.co.uk, and see what kind of info we can drum up about this beer. This ale is traditionally highly hopped and robust so it could survive the long voyage to the Indian sub-continent.The result is a full bodied Pale Ale with a zesty character. Featured at number 1 position in Independent newspaper ‘Top 50 Beers’ in November 2007. This brew came in a 16.9 oz. bottle at 5.5% ABV. It discharged a cloudy, dark orange, almost caramel type of color. The smaller off white head was sort of creamy and smooth. The retention time was ok and the lacing looked pretty decent too. The aroma was nice and bready. Scents of toasted rye bread, doughy biscuit and fresh pear intermingled with a few earthy tones. Some floral notes and a light caramel malt hid underneath. Overall, I thought the bouquet was balanced and harmonized very well. The taste seemed more herbal with savors of earth and grasses. The fruity pear was established again, but it was a bit more subdued. Flavors of rye bread and toasted biscuits began to appear as it warmed, which helped with the complexity. The bitterness was very mild, however suitable. The mouthfeel was medium bodied. Very smooth and mostly dry with an almost creamy texture. The carbonation was on the medium to low side, yet a solid shot of flavor was left behind on the palate for a few moments after each sip. Yeah, I thought this to be a nice, little, enjoyable beer. It was sturdy all around and the ease of drinkability couldn’t be denied. Obviously, with the “IPA” label one may expect a very hoppy and bitter beer, but that was not the case with this one. It was quite a bit more malty with just a subtle bite. I don’t think that I would turn it down if it were offered to me that’s for sure. You guys should give the St. Peter’s India Pale Ale a try if you see it. You may really like it. Be sure to leave a comment and tell me of you experience if you do. What’s up everyone? It’s time for another craft beer review and I want to thank you for checking in. 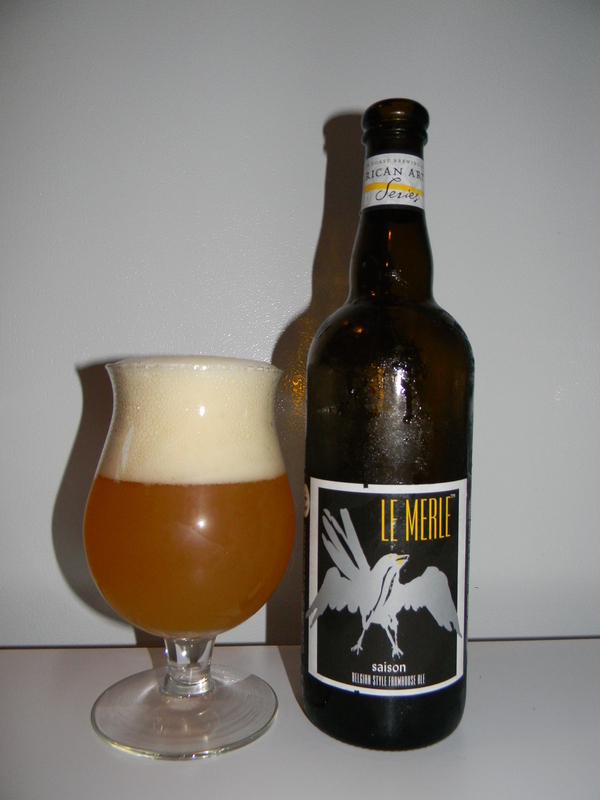 Today, I’m going to be trying the Le Merle from the North Coast Brewing Company located in Fort Bragg, California. It’s been quite a while since I last had a brew from North Coast, so I’m kind of looking forward to it. Let’s check out the website, northcoastbrewing.com, and see what it has to say about this beer, shall we? This beer came in a 25.4 oz. bottle with an ABV of 7.9%. It poured a hazy, orangish/yellow color with a white head that was greatly sized. It was rocky, soapy, soft and fluffy. The retention time was very nice and the lacing was patchy and cobweb”y”. The bouquet released some lemon along with tones of wheat, yeast, spicy coriander and a light touch of clove. Some floral and grassy fragrances came through as well while a very light banana smell coalesced with a light funkiness. More lemon citrus and light banana were found in taste. A nice bite of pepper too. The clove seemed a bit muted, yet the yeasty/wheaty components were more than accounted for. The funkiness was there, but it was somewhat subdued I thought. The mouthfeel was medium bodied. Crisp, snappy and mostly dry with a touch of bite. Even though a bit of warmth was felt from the pepper and the alcohol I also found it to be somewhat refreshing. The carbonation was rather lively and a decent shot of flavor was left behind after each sip. No doubt about it. This was a solid beer. It had a lot going on in both the aroma and the taste. Not mention that it was a fairly attractive beer standing in the glass also. The drinkability was very good and I had no trouble at all in finishing this entire bottle by myself. It’s listed as a Farmhouse/Saison style, although I found it to be very similar to a Belgian Tripel with the clove and banana aspects. Either way, if you guys have the opportunity to try the North Coast Le Merle… don’t hesitate. It’s a good beer that could surly satisfy most craft beer enthusiasts.